Klondike Solitaire is probably the most popular version of Solitaire. Also known as Fascination and Demon Patience, Klondike is sometimes erroneously referred to as Canfield. Build all four suits up from ace to king in separate piles. Deal out 28 cards into seven piles, in the following manner, called a tableau: The first pile (left to right) includes one card, the second pile includes two cards, the third pile includes three cards, etc., so that the last pile has seven cards. Turn the top card on each pile face up, so that there are 7 face-up cards. Set the remaining cards aside, forming a draw pile. As they become available, the four aces must be played above the tableau; these are the four foundations. Cards of the same suit may be played on each ace in ascending order, from low (2) to high (king). Once a card is played on a foundation, it can't be removed. 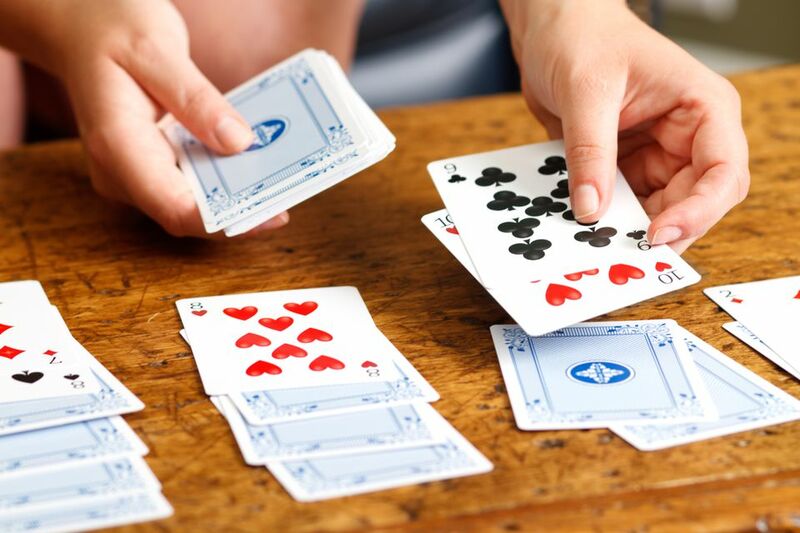 NOTE: Some computer versions of Klondike Solitaire allow you to move cards back and forth between the foundations and the tableau. This alternative rule makes the game a bit easier to win. On the tableau, cards are played in descending order, alternating colors. Always play cards on the tableau so that every card below it remains partially visible so that you can tell which cards are in the column. EXAMPLE: The 10 of hearts may be played on either the Jack of clubs or the Jack of spades. The 5 of clubs may be played on either the 6 of hearts or 6 of diamonds. Anytime you move a card from one pile of the tableau to another, turn the revealed face-down card face up. This card is now available to be played or played upon. If a column in the tableau is emptied, any visible king (or a visible king with other cards on top of it) can be moved to fill that space. Turn cards from the draw pile over one at a time. If the card you turn over is playable (either on a foundation or on the tableau), you may do so. If not, add it to a face-up discard pile. The top card on the discard pile is always available to be played. You may only go through the draw pile once. ALTERNATIVE: Pull the first three cards from the draw pile and lay them on the table face up so that only the third card is visible. If this card is playable, you may do so. If not, take the next three cards from the draw pile and lay them face up on top of the cards previously turned over. When you reach the end of the deck, you may turn the face-up cards face down and go through it two more times. Do not shuffle the cards. You win Klondike Solitaire by building all four suits up from ace to king.